In many big companies, establishment of Social Accountability (SA) system and implementation of SA 8000 standard requirements for suppliers are required. We provide complete SA 8000:2014 documentation kit, SA 8000:2014 certification consultancy, including implementation, follow up, awareness training and documentation for any small and big size organization. We guide organizations in implementing social accountability systems that intended to be a significant milestone in improving workplace conditions, such as health and safety, forced labor, child labor, discrimination, freedom of association and collective bargaining, working hours, wages, and discipline as well as health and safety conditions. Documentation is basic requirement of SA 8000 certification, which helps in quick and effective system implementation. Our team of experienced SA 8000 consultants has designed social accountability documentation to help organizations in achieving SA 8000 certification for improving social accountability environment in their organization as per revised version of 2014. To learn documentation process for quick SA 8000 certification, our ready-to-use social accountability system documentation kit with SA 8000 manual, SA 8000 policy, templates, etc. are available in easily editable formats. Our SA 8000:2014 documentation kit can be a good tool for management team for documenting the requirements in few steps. Occupational, Health, Safety Procedures (09 OHS procedures). Set of SA 8000 Policy for 2014 requirements written in plain English (07 policies). Templates for Social Committee (08 readymade templates). Sample Forms written in plain English (43 forms). SA 8000:2014 Standard Operating Procedures (10 SOPs). SA 8000 Audit Checklist - to verify implemented social environment in organization. 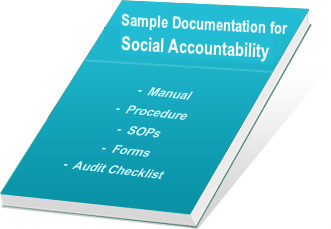 Entire SA 8000 Social Accountability certification documentation kit is available in editable (.doc) format, so users can easily edit and create new document as per their organizational requirements. All contents are well-written in simple English, so that users can translate the documents in their local languages, if required. Ready-to-use SA 8000 social accountability documents in .doc format reduce your time in documentation process. SA 8000 manual, procedures and formats provided in documentation kit can help in fine-tuning the processes and establish better control over working condition in the organization. Saves much time and cost of document preparation for revised SA8000 system certification. It helps in making total documentation, including SA8000 manual, procedures and audit checklists for quick certification. On successful completion of payment process, we provide username and password to download the product from our FTP server. Delivery of our product will be within 12 to 24 hours of receipt of payment confirmation by secure third party payment gateway. View free Demo of Documentation Kit and Purchase it with secure online transaction..